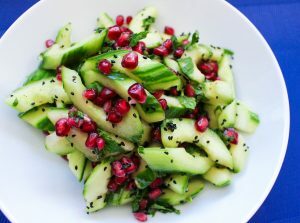 This simple, sweet and sour salad is perfect for summer. It’s light and refreshing and very simple to put together. Run a vegetable peeler down the length of the cucumber to remove some of the skin. Take a strip, then leave a strip creating a striped pattern on the cucumber. Using a tablespoon, scoop out the seeds of the cucumber pulling the seeds towards you in one long line, discard. Slice the cucumber diagonally then place in a large mixing bowl. Add the remaining ingredients, mix well then place in the fridge for about 20 minutes for the flavours to infuse. Check the seasoning then serve chilled.